A company manufactures machines for producing three dimensional solid models directly from a "Pro-E" drawing. The machine requires a precisely controlled motion system as a principal component. The construction of a 3D model involves a proprietary adhesive process to create a very thin (.007") powdered metal layer in a programmed pattern or shape. The layering continues in progression until the desired three dimensional shape is evolved. Coordinated con-trol of the motion and adhesive application is critical. The formed models are then sintered and impregnated with brass and bronze. Once completed, these units are usable as parts, dies or molds. powder box and present the adhesive agent in the prescribed shape and size. The layer cycle is completed when the vertical (Z) axis increments down by .007 inch. The solid model builds as this layer cycle repeats. Once the final layer is applied, and the model is complete, the Z axis rapidly returns vertically to the removal stations. Daedal offers the broadest spectrum of motion control products in the industry. As a result, a cost effective solutions was easily designed by integrating standard catalog products into a complete motion system . 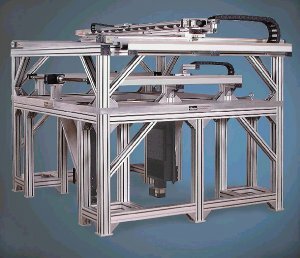 The X and Y axis gantry subsystem, located at the top of the structure, provides the motion patterns for the adhesive application. Daedals high performance linear motor driven tables (LXR Series) were a perfect fit Because of their high speed, high acceleration, accurate positioning, and rigid construction attributes. The X axis, used for applying the powder metal layer, required fast scanning motion but did not require a high degree of positioning precision. Two high speed belt driven modules, linked by a common drive shaft, were selected for their long travel (60") and cost effective performance. Rugged 400ST Series Square Rail Tables were used for the Z & Z vertical axes. The Z required precise vertical positioning of the 2,000 lb. load in increments of 0.007 in. Z provided rapid lift of the massive load to the removal station.